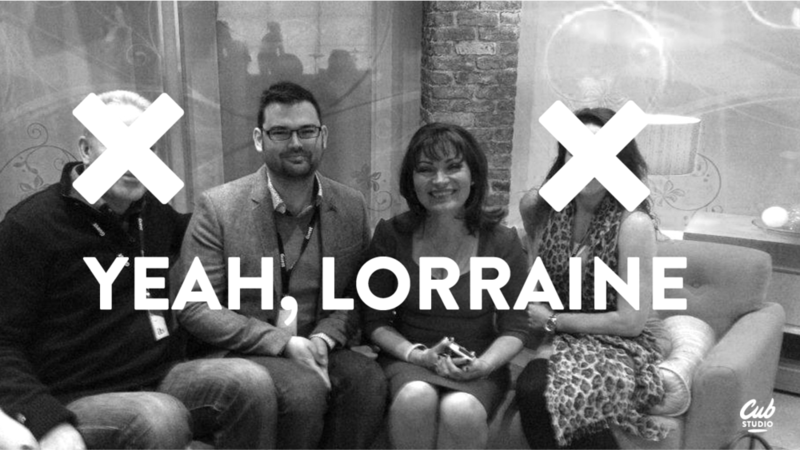 We were invited by Iain McConchie of The App Business to speak at their recent Dribbble meet up. Having carefully negotiated free beer and pizza, we agreed. The big question was of course "what are we going to talk about?" luckily both Fraser and I always have something to say. Engaging the brain before speaking is usually the issue. We decided to open with some shameless self promotion followed by more of the same, where possible we tried to disguise said promotion, with limited success. So we started off by explaining Who, What and How Cub Studio came about. 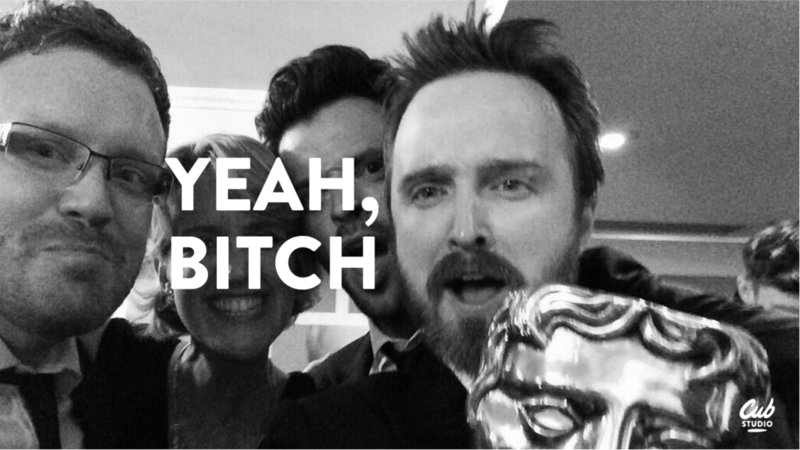 Fraser Davidson, BAFTA Award winning animator, celebrity flunkey and all round media whore, here seen hanging out with Aaron Paul AKA Jessie Pinkman from Breaking Bad. Seriously, who cares Fraser? We moved swiftly on to what is Cub Studio. The official line is "a boutique motion graphic & animation studio", but lets be honest, there's loads of these in London. Realistically, Cub Studio is growing - we'll be taking on at least one more Cub in the coming months. Cub Studio makes it's clients happy, we work hard and with them to create great work, we're honest and our animations generally surpass clients expectations - maybe our pitches undersell us?! We've specialised in explanatory videos for a while (check out our BASS Award blog post) but we're more than that, we work on numerous comedy projects and fraser also specialises in sports identity and branding. Lastly we're left with how Cub Studio came about. Fraser has been a part of Sweet Crude (and still is) for numerous years, Sweet Crude is essentially a collective of 3 or 4 animators. I have been working in online marketing for over a decade but more recently moving into the fields of UX and project management. Having both passed our 30th birthdays in recent years there was a need for change, or our lives might be exactly the same in 10 years time. We wanted to enjoy work more, to be in control of the work we do, who we do it for and ultimately build a company we could be proud of. We figured that no one would actually care too much about our history and swiftly moved on to our animations, and on Dribbble, these tend to take the form of animated GIFs. 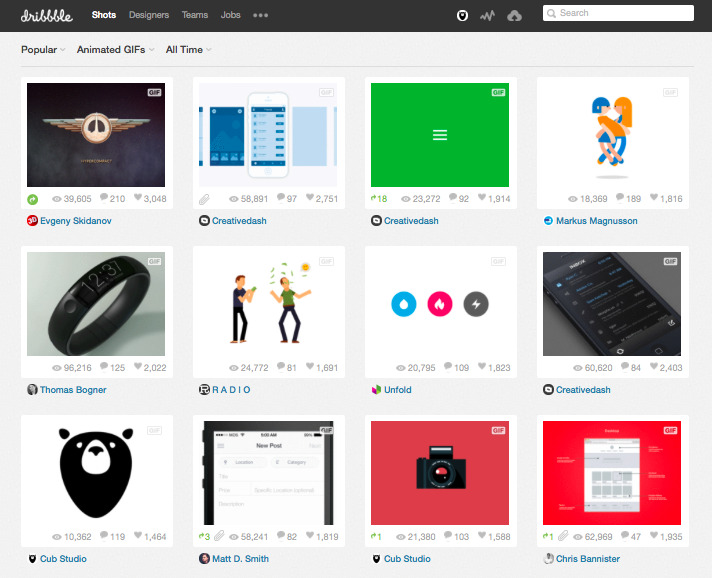 This GIF received over 1,500 likes on Dribbble and is still on the 1st page of Dribbble's most popular GIFs of all time. You might spot our Cub GIF on there as well! The full videos from which these GIFs were taken can be viewed in our animation portfolio. Firstly, Dribbble is a closed network of "designers", this means it's a great place to test elements of work - no silly comments, the odd rebound (wish there were more) but generally constructive criticism and great support. Dribbble also acts as a great shop window for our studio. Sure we have a website and portfolio, but so do hundreds of other designers/studios. Dribbble ensures our latest work gets in front of the people that matter, and the better your work the more people see it. This helps you stay on your game and also generally prevents people uploading poor work to Dribbble. This might all sound slightly survival of the fittest and elitist, but Dribbble does have a debut section for first timers that gets some great work and responses. There's also the "playoffs" section that collates rebounds - a great section to see how other minds work. So with little fanfare but a certain inevitability, here are our tips for posting animated gifs. Friday Funday - who really works on Friday afternoon? Many of you may have noticed that 80-90 likes might get you on the front page on a slow Tuesday, but its going to take closer to 200 on a Friday afternoon. This isn't a coincidence, more people are looking. For the greatest exposure, Friday is the best day to post your best work. It also gives you the chance to pick an element from your previous week's work. Looping GIFs - what's better than animation? Thats right, looping animation! If you have a nice transitional icon or some nice character animation, spend an extra 10 minutes making a seamless, self contained loop. Pro tip: Dribbble uses the first frame of your GIF as the profile image. If you start on a blank screen, thats what you'll see in your profile image. If your composition loops, you can have it start on any frame, so start it on your best frame. DON'Y JUST SHOWBOAT whilst we like to showcase our best work, we also use Dribbble to test animation on upcoming projects - collate feedback and which shots people like more and why. Use the Dribbble community as a tool as well as a wonderful place to buff your ego to a high gloss. PROCESS GIFS - you don't have to be an animator to showcase your work in motion. Dribbble is as much about the process of creating work as it is about the finished product. Photoshop allows you to create fades and cuts to show a progression from initial sketches through to application. BUILD A COMMUNITY - if you see something you like that doesn't move, why not create a GIF rebound? We love the work of the likes of Bill S Kenny of Focus, and when we saw this piece, felt we could add something to it. Having said that, while it's easier to beg forgiveness than ask permission, we were lucky that Bill was good humoured about us doing this. It's possibly best to ask permission first.